Völkmar Trommsdorff was a legend in the town of Niederthai. In a town full of ski-crazed Austrians, he was one of the craziest. 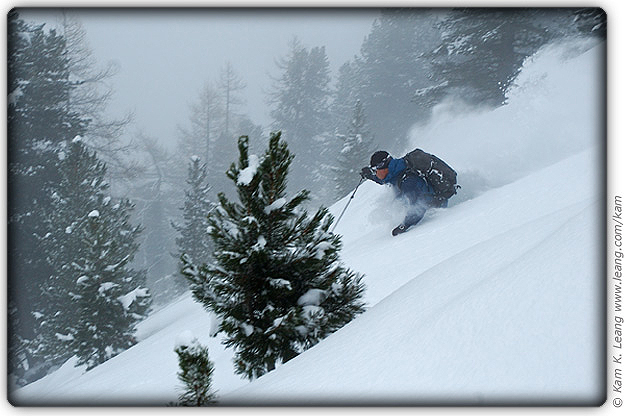 When he died in 2005 at the age of 69, he had already done 110 days of ski touring that year. The Trommsdorff family tradition for New Year's Day is to tour up to the top of der Brand, a roughly 2,000 ft. tall mountain directly in back of their house, with a bottle of Champagne. 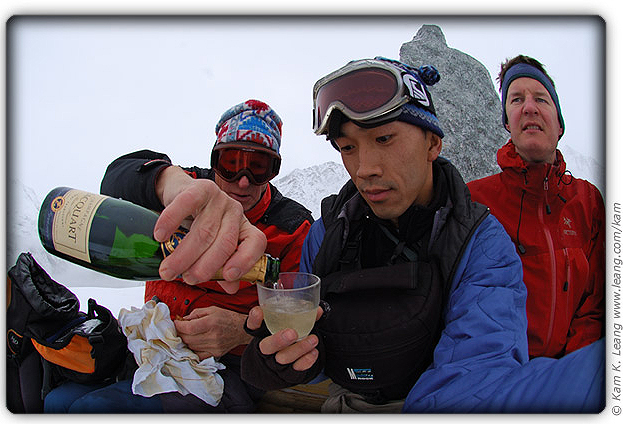 As well as bringing in the New Year, 2006 was special because the toast was to honor Michael's uncle Völkmar, who had done the trip over 400 times. We set out literally from the driveway, with Peter and Gitta leading the way through the field in back of the house. Kam, Michael, some of the cousins and I walked to the Falknerhof Hotel instead, and started skinning where the trail turned upward, pausing to talk with the owners of the hotel for a few minutes (Florian's brother and his girlfriend). The route was a narrow road for the first 1,000 vertical feet or so, then turned to moderately steep skinning through widely spaced trees. Weather was a bit of a disappointment after the first two bluebird days with drifting fog and about -2º C temps, pretty much a Pacific Northwest sort of day. 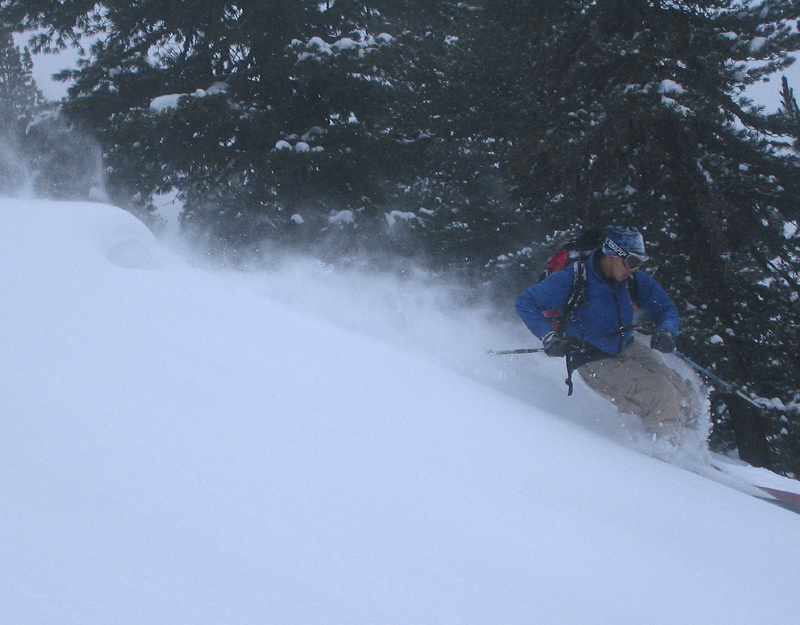 There was, however, about a foot and a half of fresh snow with only a few Trommsdorff tracks from the past few days. Peter seemed inspired and pushed on ahead, while the rest of us took it easy on the way up. At the top, another of Michael's cousins was already there. They wasted no time in opening the Champagne and pouring glasses for the rest of us who were just arriving. We sat on the bench, toasting the New Year and Uncle Völkmar, while admiring the memorial stone and the surrounding valley. And the skiing? For the Trommsdorffs, New Year's Day or not, skiing rules. 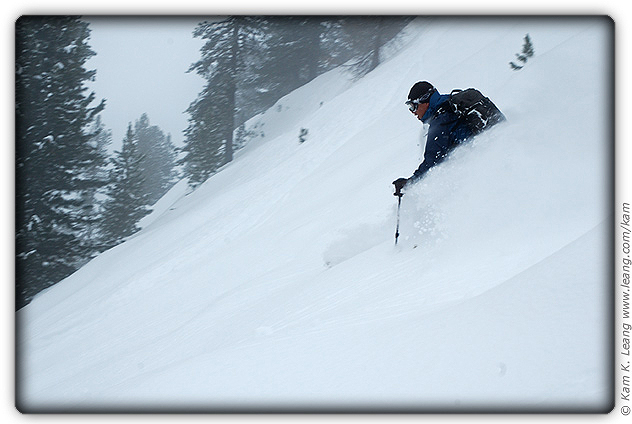 As the pictures above indicate, it was a full on powder day complete with face shots and just enough tree coverage to give you some perspective on the terrain. Fröliches Neu Jahr, Völkmar Trommsdorff!